Irrespective of age or situation, statistics tell us that one in three people in England will suffer from cancer at some point in their lives, and one in five of those people will lose the battle. Whilst some life-styles can pre-dispose a person to developing cancer, the disease still strikes indiscriminately. One fact however, is a sure certainty – wherever cancer occurs, it brings heartache and fear along with it. 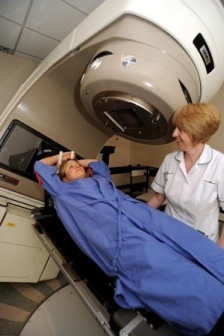 Weston Park Hospital is one of only three dedicated cancer hospitals in the country. Its world-leading reputation as a centre of excellence in the fight against cancer is recognised, not only here in the UK, but also internationally. Our purpose-built Cancer Research Centre, partly funded through charitable gifts and donations, is fully integrated within Weston Park Hospital and is credited as a pioneer of numerous mode rn advances within the field of cancer research. At the heart of all our endeavours are the patients and their families themselves. Dealt hand-in-hand with the obvious debilitating effects of cancer comes the emotional, financial and practical challenges that this disease engenders. A Cancer Information and Support Centre has been built specifically at Weston Park Hospital, offering ongoing help and advice to patients and families coping with daily life under very difficult circumstances. Weston Park Hospital’s expertise resides in its range of effective radiotherapy and chemotherapy treatments that are performed here. Patients travel from all across the country, in some cases even from abroad, in order to receive the specialist treatments and care for which Weston Park is renowned. A purpose-built Teenage Cancer Unit, with its comfortable ‘home-from-home’ atmosphere, caters for the needs and emotional support of young cancer sufferers (between the ages of 16 and 25), for whom the treatment experience may be particularly daunting. For patients undergoing a more intensive regime of chemotherapy (not suitable for administering on the new chemotherapy unit), Weston Park possesses 78 inpatient beds spread over 4 separate wards. An additional 10 chemotherapy chairs are also situated within the wards, facilitating treatments of a longer duration. An average of 30 people per day visit the hospital’s chemotherapy unit as outpatients. Our own consultants also work tirelessly alongside a number of outpatient clinics in the surrounding areas of Rotherham, Doncaster, Barnsley and Chesterfield, to help plan the most beneficial chemotherapy treatments for people attending their own District General Hospitals. Surgical procedures are generally conducted either at Sheffield’s Royal Hallamshire or Northern General Hospital, whose exemplary surgical teams provide continual support for Weston Park and its patients. However, minor surgeries involving less invasive procedures are routinely performed at Weston Park. See here for details about how to claim your free parking.